Aces: Went 6-0 in 3-setters during clay circuit. … Leads tour in percentage of return games won at 50.2 this season. Topspin: Pulled out of grass-court tuneup in Eastbourne, citing an Achilles injury. … Coming off first major title, at Roland Garros, so finally knows she can win the big one. Aces: 2006 junior champion at Wimbledon. … First Grand Slam title as a professional came in January in Australia. Topspin: Wimbledon is only major where she’s never reached at least a quarterfinal; showed she knows how to get her game to work on grass by winning Eastbourne title Saturday. Aces: Is the only player to beat each Williams sister in a Grand Slam final, including Venus at Wimbledon for last year’s title. Topspin: Dropped only one set on the way to the 2017 trophy at the All England Club and certainly capable of another such run. Aces: Either reached the final or lost in the first round at each of the past four major tournaments, including title in New York and runner-up showing in Paris. Topspin: Her court coverage and ability to go from defense to offense make her a threat on all surfaces, including grass. Aces: Pulled out of grass-court tuneup with hamstring injury. … Leads tour with 7-1 record against top-10 opponents in 2018. Topspin: A popular pick to win what would be her third title at the All England Club. If she’s healthy, her lefty serve and forehand work well on the grass. Aces: Making 21st Wimbledon appearance. … Most recent major title came at the All England Club in 2008. Topspin: After reaching two Grand Slam finals in 2017, lost in first round of both so far in 2018. Every time folks are ready to write her off, though, she makes another strong showing. Aces: Only six women have won a higher percentage of service points this year. Topspin: If she can reach a major semifinal on clay, as she did at Roland Garros, should be able to go far on grass. Aces: Playing at the All England Club for the first time since becoming a mother last September. … Sat out Grand Slam action for 16 months until returning at the French Open in May. 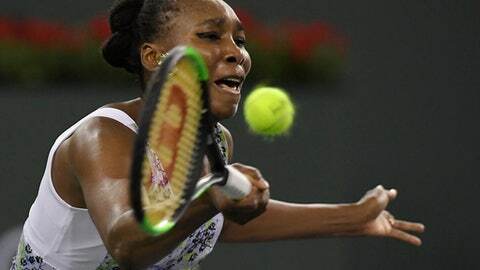 Topspin: Never overlook Williams, no matter how few matches she’s played recently.